...they'd have to put me away for life. 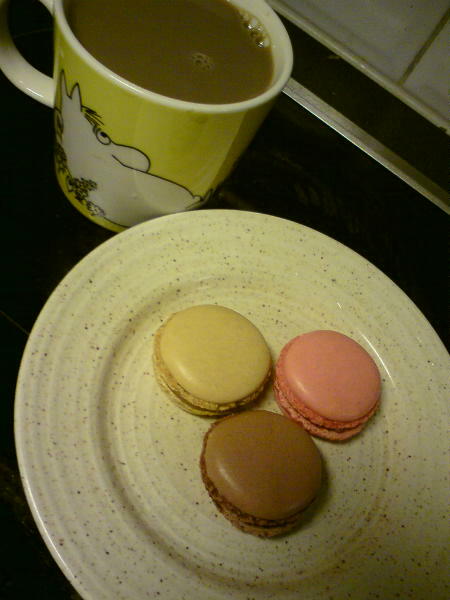 Macaron mission accomplished. I tried vanilla and caramel yesterday, and had intended to just buy chocolate and raspberry today. However, the caramel was sooo good, I couldn't resist! I also managed to squeeze in some junk food from the Philippines, namely Oishi Spicy. No interest in trying passionfruit and licorice, but the salesperson helpfully/deviously mentioned that they have new flavors that she just hasn't gotten around to putting on display yet: citrus, lime and pistachio. No need to worry too much about my new addiction though. Tomorrow will be my last day in that neck of the woods. Hi Blog! It's been awhile.